Do you know when to make a change in your career? 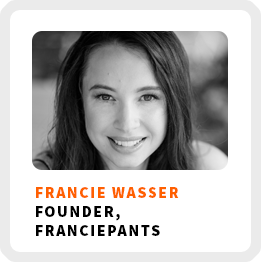 Francie Wasser will inspire you to pay attention to your inner voice and to your body, so you know when it’s time to get unstuck and make a change! She’s the founder of FranciePants. She makes fashionable 100% cotton women’s underwear, made by a team of local sewers she’s training to help provide local job opportunities. She’s doing it with no prior experience in the fashion world, but says her diversity of work experiences prepared her for this unique opportunity. She sees a world in which home-based manufacturing will one day become much more common than it is now. She shares why her first business failed because of her lack of focus and passion for the business. Why she changes her career ever 4 years and the signals that let her know it’s time for a change. Why having a passion for your business is key for long-term growth. Wake up time: About 7:30 am, whenever when the sun comes up. Core work activities + habits: 1) Communicating about her brand, telling people what she’s doing and why. 2) Cultivating the online and social media presence for her brand. 3) Developing the manufacturing pipeline. Ideal work environment: During the day, in her home office complete with a window and her dog. A variety of workspaces based on the work. 1) Narrow the focus of what you’re reflecting on. Don’t worry about what the big, long-term vision is, just work on smaller bite-sized pieces based on what you’re feeling right now. Then you can work out from there to examine other scenarios in your life. 2) Give yourself permission to admit the things you know to be true. Be open to your honest feelings about things and when you’re unhappy, otherwise, you may not have an opportunity to make a needed change.